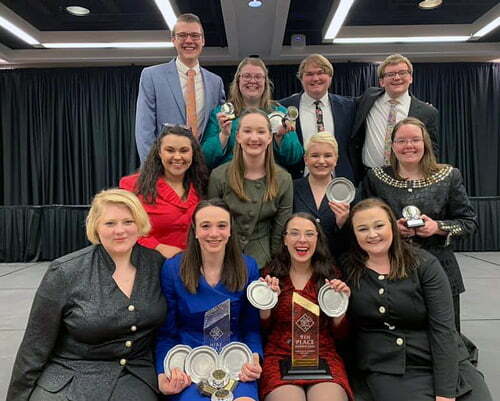 The Hastings College Broncos Forensics (speech) team finished 9th in the nation at it’s national tournament, the AFA-NIET, which was held recently in Tuscaloosa, Alabama. This is the second year in a row the team finished in the top 10 — the Broncos finished 8th last year — and it’s the first time the team has had back-to-back top 10 finishes since the 1999-2000 years. Carly Spotts-Falzone, a senior from Wayzata, Minnesota, was named an All-American at the tournament. She is the 15th All-American in forensics from Hastings College. Spotts-Falzone also finished in 14th in individual sweepstakes and was the first Hastings College student to break five events to out rounds since 2000. Members of the Hastings College Forensics team following nationals. Alli Kennon, a junior from Lakeville, Minnesota, was named as a national student representative to the American Forensics Association (AFA). She is the first Hastings College representative to ever be on the national committee. Director of Forensics Dr. Kittie Grace was elected to serve her second term as the 2020 Sexual Harassment Officer for the AFA. During the tournament, she provided all participants with Title IX training. Courtney Hanson, a sophomore from Brookings, South Dakota, who broke into quarterfinals with Poetry, Prose and semi-finals with Program Oral Interpretation. Elizabeth Hansen, a junior from Fremont, Nebraska, who broke into quarterfinals in Impromptu Speaking. Alli Kennon, a junior from Lakeville, Minnesota, who broke into semi-finals in Prose and Duo with Carly Spotts-Falzone. Melissa Loney, a junior from Omaha, Nebraska, who broke into semi-finals in Communication Analysis. Carly Spotts-Falzone, a senior from Wayzata, Minnesota, who broke into quarterfinals with Prose, semi-finals with Dramatic Interpretation, Program Oral Interpretation, and Duo with Alli Kennon. The Forensics team hasn’t had three competitors break in the same event at the same time since 2005 — this year that was matched by Hanson, Kennon, and Spotts-Falzone, who all broke in Prose. Hanson was also the first underclassman to break three events into out rounds since 1997. All members of the team qualified for AFA-NIET, and they brought 45 events to the competition. All students and events are listed below. Chloe Carson, a first-year student from Eagan, Minnesota, brought Dramatic Interpretation, Program Oral Interpretation and After Dinner Speaking. Sam Johnson, a first-year student from Hastings, Nebraska, brought Impromptu Speaking. Claire Nelson, a first-year student from Bagley, Minnesota, brought Impromptu Speaking, Extemporaneous Speaking, Persuade, Dramatic Interpretation and After Dinner Speaking. Conner Taylor, a first-year student from Omaha, Nebraska, brought Program Oral Interpretation, Dramatic Interpretation and After Dinner Speaking. Sam Burke, a sophomore from Denver, Colorado, brought Prose, Persuade and Extemporaneous Speaking. Courtney Hanson, a sophomore from Brookings, South Dakota, brought Prose, Program Oral Interpretation, Duo with junior Nathan Navratil from Lino Lakes, Minnesota, Poetry and After Dinner Speaking. Elizabeth Hansen, a junior from Fremont, Nebraska, brought Impromptu Speaking, Duo with junior Melissa Loney from Omaha, Nebraska, and After Dinner Speaking. Alli Kennon, a junior from Lakeville, Minnesota, brought Prose, Info, Duo with senior Carly-Spotts Falzone from Wayzata, Minnesota, Duo with junior Jadah Morrison from Chaska, Minnesota, Communication Analysis and Dramatic Interpretation. Melissa Loney, a junior from Omaha, Nebraska, brought Impromptu Speaking, Info, Duo with junior Elizabeth Hansen from Fremont, Nebraska, and Communication Analysis. Jadah Morrison, a junior from Chaska, Minnesota brought Prose, Duo with junior Alli Kennon from Lakeville Minnesota, Persuade and Dramatic Interpretation. Nathan Navratil, a junior from Lino Lakes, Minnesota, brought Info, Impromptu Speaking, Duo with sophomore Courtney Hanson from Brookings, South Dakota, Program Oral Interpretation, Dramatic Interpretation and Poetry. Carly Spotts Falzone, a senior from Wayzata, Minnesota brought Info, Prose, Duo with junior Alli Kennon from Lakeville, Minnesota, Program Oral Interpretation, Dramatic Interpretation and Poetry.